An important part of the ultimate living experience is to be able to control your environment and set the perfect ambiance for any given situation. 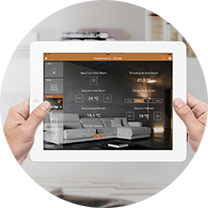 A home Automation system controls all your lights, curtains, air-conditioning, music system and even your TV screens. With the push of a single button from anywhere in your house, light will adjust to the preferred setting for that time of day, the curtain will open or close and simply adjust, the temperature will adapt, and the music will start. Adding to this everyday convenience, a lot of further options are available, such as the ability to control outdoor irrigation, outside lighting, all fully integration with Iphone/ipad, and android devices.